Tune Into The Accurate Yes/ No Oracle of Your Heart! 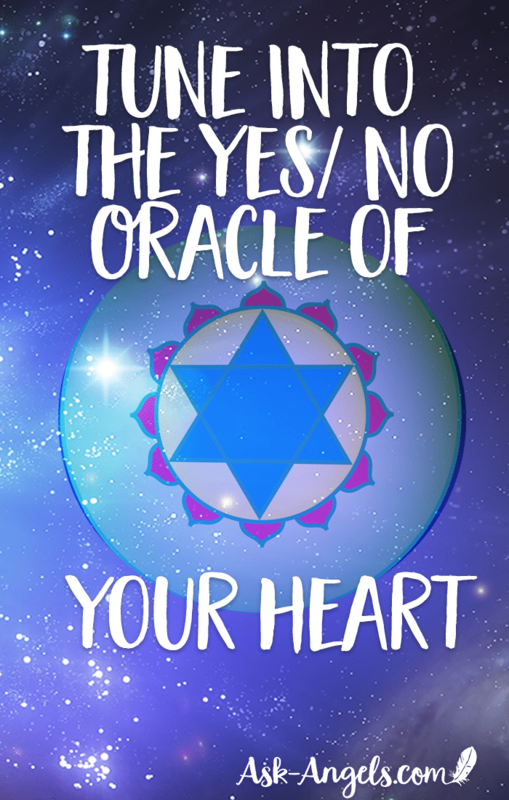 You have access to a powerful source of inner guidance, and in this post, you’re going to learn how you can access it through the yes/no oracle of your heart! If you’ve been reading my site for a while now, you've probably already heard me talk about how your heart is the center of your multidimensional being. Through your heart you can access the direct guidance, love and healing frequency of the higher Angelic realms and you highest Divine Self. And by simply tuning into your heart center you can access clear yes and no answers, just as you would from an oracle. When I talk about your heart, I am talking about your heart center, otherwise known as your heart chakra at the center of your chest, so it’s not your physical heart as much as your energetic heart. The way that you tune into your heart center, is by first focusing your awareness within. Focus your attention on your heart center, the center of your chest and of your multidimensional being, and start imagining golden, white light all around you. Envision yourself breathing the light into your heart center, allowing your heart to open. Take a few moments just really focus in on your heart center. As you breathe light into your heart, imagine it glowing more vibrantly and as you exhale, let it grow larger. Now, you can take your left hand which is your receiving hand and place it over your heart. So, to receive the guidance of your oracle, place your left hand over your heart center and then just ask a question. Ask your question with your hand held over your heart, and then simply tune into your heart center. This was just an example question, of course, but you can ask anything you like. You can ask if it’s for your highest interest to move to a new city, to change up a relationship, if it is in your highest interest to eat certain foods or take a certain action. Just place your left hand over your heart and ask the question. When I ask this question, and tune in… My heart so clearly and undeniably expands. On the other hand, when I ask: “Is it for my highest and greatest good to order a pizza for dinner?” I experience my heart contracting, like the energetic quality of my heart drops. When the answer is a yes, your heart will light up, you feel a warmth and expansion and upliftment. And when the answer is a no, your heart contracts, your energy drops just a little bit and there is a bit of a decline or decrease in the energetic quality of your heart that you are tuning into. Through paying attention to the response of your heart center, when you ask a yes/no question, you have access to the most powerful yes/no oracle there is. This is so much more powerful than a magic eight ball or using a random yes/no oracle generator online. You have access to the direct guidance of the divine and of the higher realms of spirit. It’s always available to you. It’s always available within. So, place your hand over your heart, and tune into your heart light, breathe and let your awareness enter into your heart center. Let your heart expand and fill with light. Let yourself really relax and let go of the outcome, let go of needing to know the answer to the question or wanting the answer to sway a certain way. It can also help to really ground your energy in the present moment before you begin. Feel your energy flowing down, grounding to the center of the earth, to the core of mother earth, feel your oneness with the earth and all that is and then let that light flow up, up along your spinal column, up into your heart, up into direct presence with the divine. Expand your awareness, breathe, relax, and lift. Feel your connection to all that is and then really focus in on your heart center and ask your question. Listen, feel, and tune into the guidance of your heart, trusting that you have the ability to access clear guidance in this way. Then act upon the guidance you receive and know that the more you practice this, really being present and paying attention and raising your vibration through presence and tuning into the guidance of your heart, you can begin to not only receive yes/no answers through that expansion or contraction of your heart, but you can begin to receive more in-depth, profound and meaningful messages and guidance through your heart center from the divine and Angelic realms because this guidance is always available to you. It just takes a shift in perspective, a shift inward and focus to open your heart, lift, enter in and tune into the guidance always available to you, the most powerful oracle you have access to, your heart center. Tune into it and enjoy the benefits of following this clear guidance because when you listen and act upon the guidance you receive, incredible blessings and opportunities have a way of unfolding in your life. Take some time now to focus inward, imagine the light all around you, and know you’re your imagination is like a doorway into the inner realms of intuition. Imagination gets you to the doorway and then intuition kicks in, allowing you to step through, to bring through the guidance that will most serve you in progressing on your highest path of embodying your full light and true divine nature in the physical. Tune into the guidance of your heart, let me know how it goes and I’ll talk to you soon. Improve the Accuracy of Your Angel Card Readings!